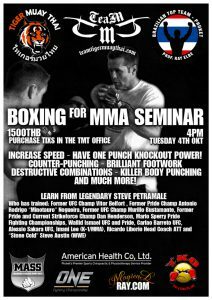 Tiger Muay Thai and MMA Phuket is thrilled to have the opportunity to host Steve Petramale at our Muay Thai and Mixed Martial Arts training facility on Oct. 4th for a Boxing seminar. Steve appeared on the National Geographic documentary ‘Fight Science’ and for years served as the boxing coach for Brazilian Top Team. Having worked with legendary fighters such as; Vitor Belfort, Minotauro Nogueira, Murilo Bustamante, and Mario Sperry, his reputation as an instructor has been proven. Seminar space will be limited, and at only 1,500THB for the 2 hour seminar, space is expected to sale out. To RSVP your place speak to ‘Joey’ or ‘Philippe’ in the office.